In the museum of Kryptonian history, Jeyra and her friends have the Legion members defeated. 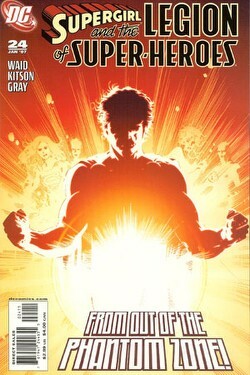 Supergirl arrives, but is powerless under Rokyn's red run. Luckily she's able to read Kryptonese and finds some weapons among the museum's exhibits and uses them to defeat the intruders, who are able to teleport away at the last second. The Legion takes the Phantom Zone projector to see if they can figure out who is trapped inside, because criminal or not they've been in there for a thousand years. We then get a history lesson on Kandor and how the first few decades were hellish on the inhabitants, until they learned how to live together, work together, recycle every scrap of waste and debris. They've spent generations becoming one with their city, and this is the explanation given for why Kandor is still just one city reaching high into the skies instead of spanning out across the globe. They've become one with their city and do not wish to leave. Light Lass seems to think it's because the city's rulers are worried that if the Kryptonians in the city found out they would be Supermen on other planets they'd all leave, but a point is made about that diluting and all but being the end of the Kryptonian race. But it's time for the Legion to go, and they're told their goodbye to Kara must be a final one for outsiders are only allowed in Kandor in cases of extreme emergency. Just then Cosmic Boy has a change of heart and asks Kara to stay with them, which she's only too happy to do. Back at Legion HQ, Lightning Lad is working on a speech to announce his candidacy for Legion leader, and gets some precognitive advice from Dream Boy, who contemplates running for leader himself. By combining their powers, Saturn Girl and Phantom Girl are able to communicate with Mon-El inside the Phantom Zone and discover that he's been trying to warn the Legion all along, because he can see that they're in danger. The villains the Legion was fighting back on Rokyn (Jeyra and her friends) have arrived, and the last page shows dozens and dozens of costumed villains descending upon Legion HQ. Story - 4: I have some problems with this issue. Mainly that Kandor and the whole "leaving Supergirl there because she's too dangerous" story is already resolved. I know, I know, I've been complaining that there are too many unresolved stories going on simultaneously, so how can I complain about this? Because it doesn't seem to make sense, that's how. Cosmic Boy wants to leave Kara with her people to learn about herself and because she's too dangerous, and then one act of her doing the hero thing and saving the Legion and he's suddenly completely reversed his stance. It seems too easy, and it's easy because Waid of course never intended to leave Kara in Kandor. And then that begs the question, why did we go there? Well, to get the Phantom Zone projector and Mon-El, whose only purpose thus far has been to warn the Legion they're about to get attacked mere seconds before it actually happens. I'd argue any museum on earth could have had the Phantom Zone projector in it and thus there was no need at all for the Kandor storyline, and THAT is what bothers me. Aside from that, however, this issue was very good and felt much more like the Legion issues of old that I've been longing for. And the setup for a big fight in Issue 25 is there, so that should be a good read. Art - 5: Back to Kitson as I love him. Kara looks like she's seriously pissed off on page 5, which is a really cool image. The shot of her in the middle of page 9 and lower left of page 10 are just about perfect as well. And Kara's expression when hugging Cosmic Boy after he asks her back into the Legion is perfectly full of joy. This is classic Kitson, which absolutely ups my overall enjoyment of the book. Really great stuff, even if 1979 called and wants Dream Boy's hair back. Cover Art - 4: Disregarding the words on the cover (which aren't entirely accurate, but are close enough for government work), this is a pretty cool image. The sad part is that it makes you think Mon-El's getting out of the Zone, or the procurement thereof is at least the focal point of the issue. It's not, and thus it's misleading and/or irrelevant to the actual story, which is a problem I've had with several Legion covers. The art itself is great, the concept just doesn't fit this particular story. So whoever is making the decision of what to draw (Mr. Kitson or the editors) needs to shape up a bit. Stay on target, Red 5!